I was lucky enough to catch Diana Rodgers of Sustainable Dish when she was in Houston, TX at the end of May this year. We met at the Last Organic Outpost, which is worth going to and checking out what great work they are doing. She spoke to the guests about sustainability and Paleo with a Q&A followed by book selling and signing. 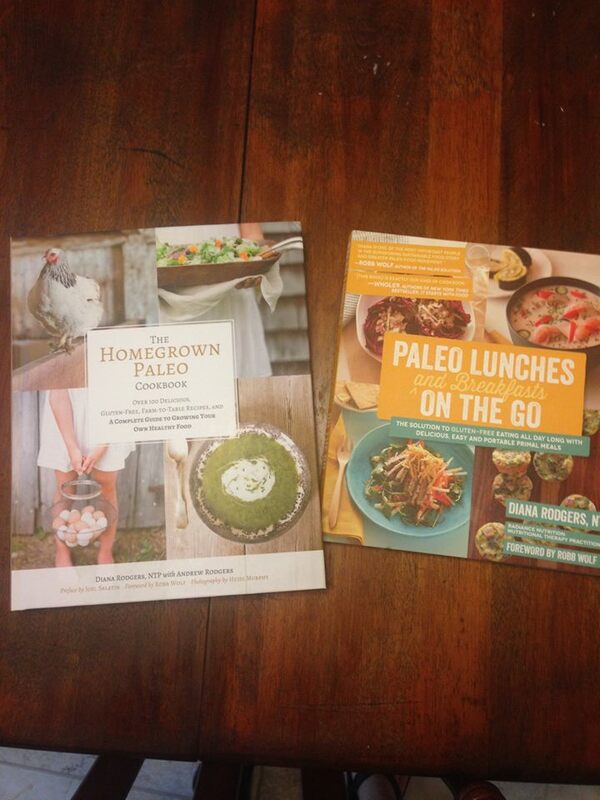 I purchased The Homegrown Paleo Cookbook and Paleo Lunches and Breakfasts On the Go that day. 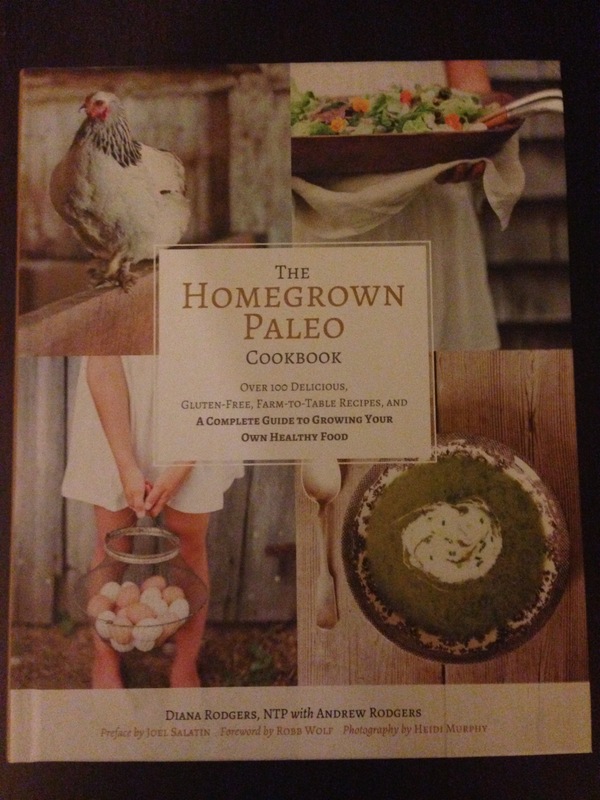 I want to share my thoughts on The Homegrown Paleo Cookbook with you. First of all, the book has been well produced. It is made of good sturdy materials. The pictures are beautiful. I love the pictures on the front cover of the book. Although I thought I was purchasing the book for the recipes, because I’m a recipe junkie, I got the book home and realized what a fascinating and fantastic resource this book is. I learned so much from the front section of the book; almost like an interesting text book or encyclopedia…..in the best possible sense. The book starts out talking about sustainability. Then teaches you how to raise your own food animals (chickens, turkey, ducks, rabbits, sheep, goats, pigs, cows, bees) including slaughtering and processing. She also covers seafood and hunting. The book then discusses growing your own vegetables and fruits (building your soil, planting, composting). Also, how to forage off your land. One of my favorite areas of the book is “The Ideal Homestead Setup” on pages 144 – 145. These two pages breakdown, in pictures, how much of each animals etc. you can fit on your various size land parcels. Then the book goes into the recipes. Since the book is centralized around the sustainability idea she has the recipes sectioned out into seasons: early, mid, and late. I found that generally speaking the recipes are not necessarily dishes I would make everyday. They tend to be more items I would make for a dinner party. 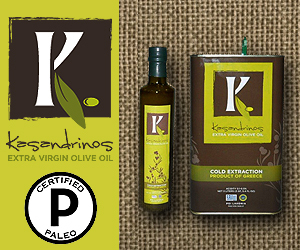 Some of the recipes have longer ingredient lists, which I tend to stay away from, some of them though are ingredients that most Paleoers keep in their kitchens on a regular basis. The other recipes are simple, few ingredients, and look good and easy to cook. I like that she also covered the basics on homemade fermenting (example: Kombucha). The ending section of the book is quite thoughtful and creative. She continues the sustainability application by showing how to do fun lifestyle things like….naturally died Easter eggs, making beeswax candles, goat milk soap, pig roasting, and making a clambake to name a few. 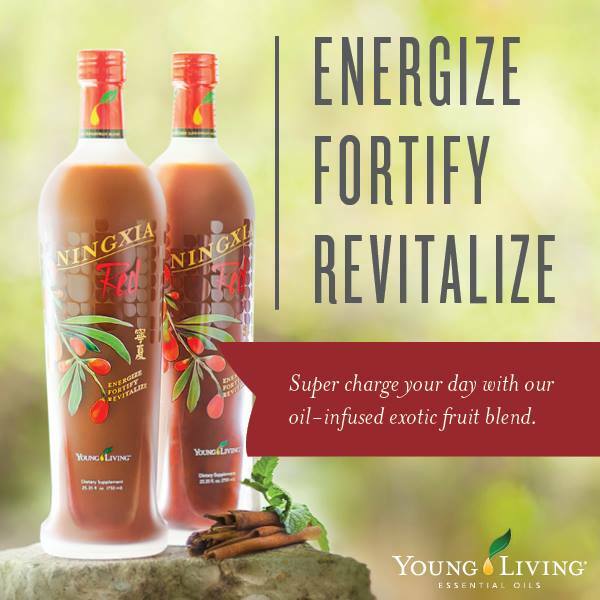 She also discusses the importance of giving back or paying it forward. I do not have a homestead or parcel of land to apply most of the book, however she covers growing food in small spaces and container growing. She did a good job of making this book apply to everyone. The beginning of the book is inspiring to this country girl…who lives in the city. This book can easily be used as a “coffee-table book”. To Buy or Not to Buy….That is the question……I say YES!